Churches, homes and the police headquarters in the small northeast Nigerian town of Geidam were set ablaze in a wave of night time gun and bomb attacks by a radical Islamist sect, said the police. Boko Haram, whose name translates as “Western education is forbidden” from the local Hausa language, has claimed responsibility for dozens of shootings and attacks with improvised explosive devices this year. 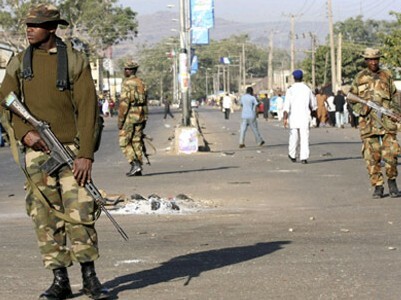 “The Geidam divisional police headquarters and First Bank were bombed on Saturday evening by Boko Haram and fire was exchanged into the night between police and Boko Haram members,” a police spokesman told reporters, Reuters reports. Geidam is a small town in Yobe state, which straddles the Nigeria-Niger border, and is the home of the powerful state governor. Boko Haram often targets politicians, who the sect say are corrupt and have left the northeast region impoverished. Boko Haram’s attacks have mostly taken place in and around Maiduguri, the capital of Borno state, which borders Yobe state and neighbouring countries Niger, Cameroon and Chad. A boost in military numbers in recent months in Borno has pushed the sect’s attacks further afield, security sources say. Boko Haram claimed responsibility for an attack in Damaturu, the capital of Yobe, earlier this month that left at least 65 dead. It was also behind two bombings in the capital Abuja this year, the latest in August, a suicide attack at the U.N. building which killed 26 people.